This entry was posted in Kheer/Payasam and tagged Condensed Milk, Milk Kheer, Payasam on November 22, 2014 by vikashbhardwaz. 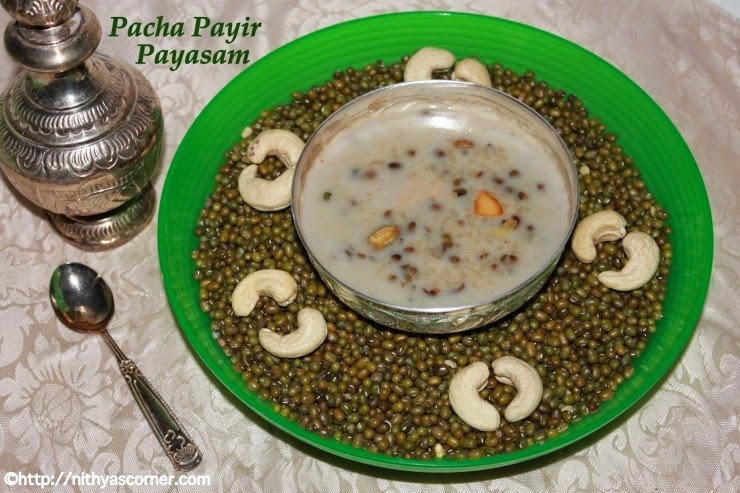 My mom’s makes Pacha Payir Payasam very often. 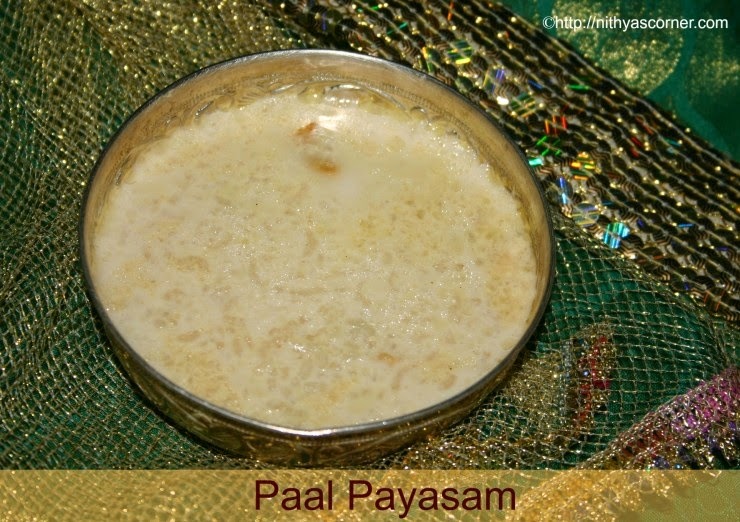 It is my family’s favorite payasam. 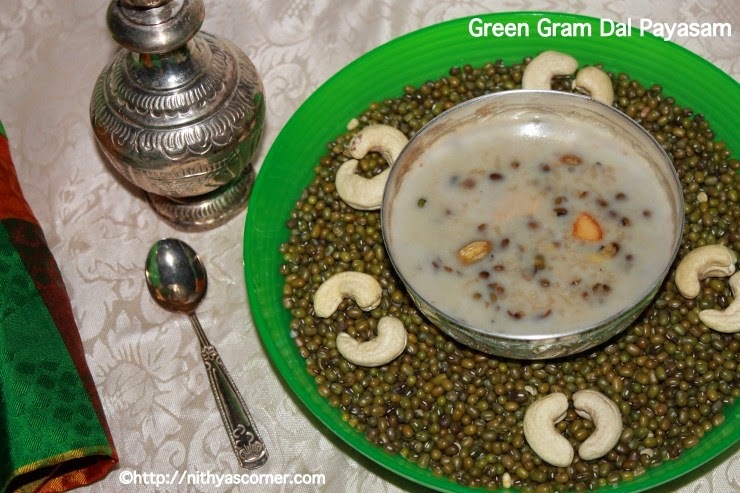 Compared to some payasams, I feel Pacha Payir Payasam is quite healthy because of the Green Gram. I cannot express how much I like this payasam. I will break the appalam into pieces and add it to the payasam. Then I will eat it very slowly relishing the taste. My mom makes this payasam as evening tiffin for us when we come from school. If she makes appalam along with the payasam, then it is an added bonus (happiness) for me. I can never say no to this payasam…Just love it. Cashew nuts (mundhiri paruppu) – 10 – 15 nos. 1. 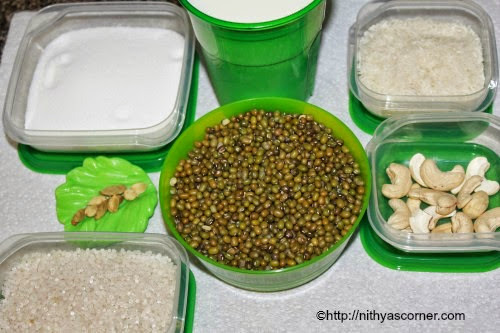 In a cooker, add green moong dal and rice followed by 6 glasses of water. Cook the dal and rice for 6 whistles. 2. Open the cooker lid only when the pressure has released completely. Boil 1.5 cups of water in a pan. Add sago (javvarisi), reduce the flame, and allow it to cook until it turns transparent. Keep stirring occasionally, and when the sago turns translucent, remove from heat and keep it aside. Let it stand for 10 minutes. Keep stirring continuously so that sago doesn’t stick to the sides and bottom of the pan. 3. Add the cooked sago (javvarisi) along with its water to the cooked dal and rice. Stir once. In a small pan, fry the cashew nuts and cardamom until golden brown using 1 teaspoon of Ghee. 4. Now add the fried cashew nuts and cardamom. Add desired amount of sugar and specified quantity of milk. Stir well. 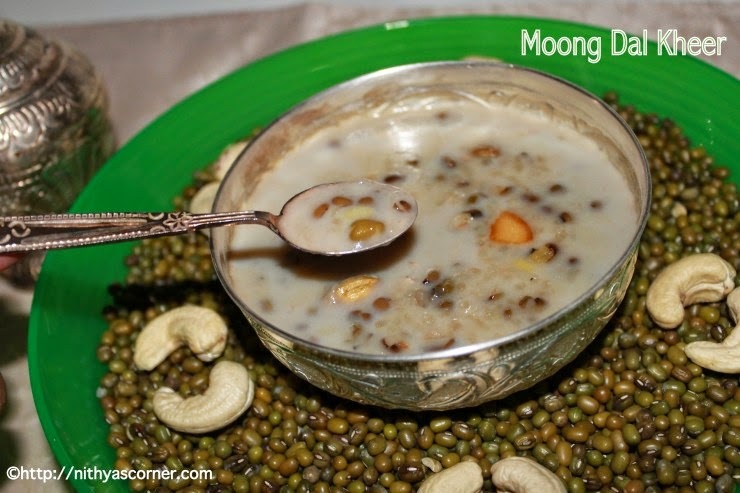 Now, Pacha Payir Payasam/Moong Dal Kheer is ready! This entry was posted in Kheer/Payasam and tagged Cashew nuts, Pacha Payir Payasam on November 22, 2014 by vikashbhardwaz. My mom makes Semiya Javvarisi Payasam for all the occasions. Sometimes, I like to have the payasam along with pappadam and also with vadai. I used to think I had a weird taste of eating payasam with appalam and vadai but then came to know some of my friends also eat it this way. Though there are so many payasams, for some reason my mom makes this payasam often. It makes your stomach heavy because of the sago and vermicelli. I wanted to post this recipe since long time. Finally I am doing it now. 1. Boil 1/2 cup to 3/4 cup of water in a pan. Add the javvarasi/sago to the boiling water and cook until they become transparent and soft. In another pan, fry the cashew nuts and raisins in a teaspoon of Ghee until they cashew nuts turn golden brown and raisins plump up. Add them to the boiling water. 2. In another pan, fry the vermicelli/semiya in a teaspoon of Ghee until it turns golden color. This will take three to four minutes. Keep the vermicelli aside. If your vermicelli is roasted, then you can skip this step. When sago is almost cooked (sago should become transparent and bigger in size), add the vermicelli/semiya to the boiling water. Vermicelli will get cooked in the boiling water in a couple of minutes. 3. Now add sugar and stir until the sugar dissolves completely. After fifteen minutes, it will thicken. Then add milk followed by cardamom powder and saffron(optional). Adjust the consistency by adding more or less milk. Boil until the kheer reaches your desired consistency. 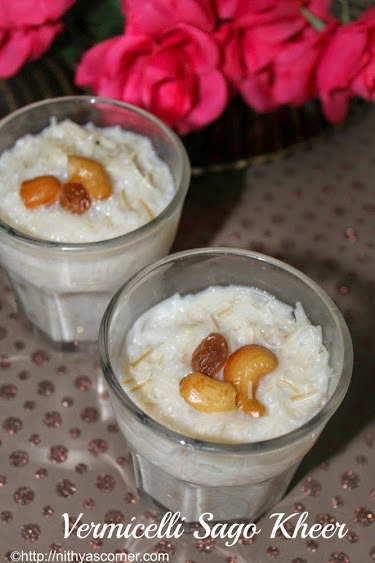 Now, Vermicelli Sago Kheer is ready! Serve it warm or cold! Rinse sago well in running water to remove excessive starch or else sago will become sticky. For fast cooking, soak sago in water just before cooking for about 30 minutes. You can also powder the nuts and add it to the kheer. You could add condensed milk instead of sugar for rich flavor. Do not add both as the kheer would become very sweet. You can also add 1/2 the quantity of sugar and 1/2 the quantity of jaggery but the taste would differ. 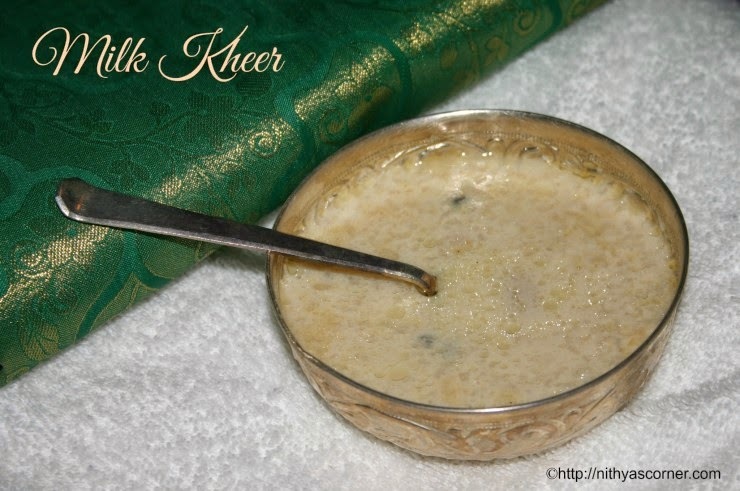 If kheer thickens, add more milk and sugar accordingly and boil it for two to three minutes. This entry was posted in Kheer/Payasam and tagged Cashew nuts on November 22, 2014 by vikashbhardwaz.